Our group is getting ready for another walk in the moderate heat of the afternoon: All water bottles received a refill, and I have stocked some “just in case” cookies. We leave in single file and without speaking. First we head for the fever tree forest. We have not gone far, but we gladly accept a short rest. Temperatures are much cooler under the green canopy than “outside” in the glowing sun. The trees are worthwhile a closer look – their bright green-yellowish stems are beautiful to look at. One of the rangers explains where the trees got their name from. 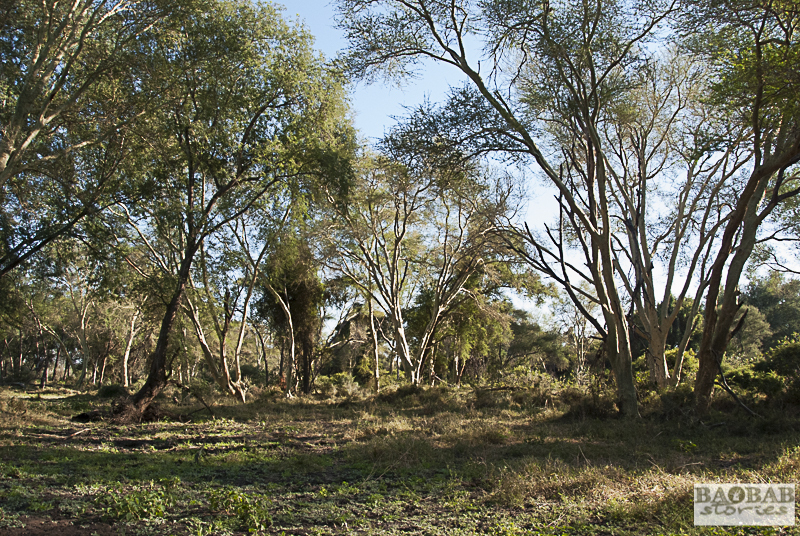 Early settlers believed that those who slept in the shade of the fever trees would get malaria. For them, the Anopheles mosquitoes were not yet known as hosts. They concluded from the increase in diseases of people in the fever tree forest that the proximity to the trees or their contact with it must have something to do with falling ill. Their only contribution to malaria is that it is always a bit swampy around the trees and wetlands are the preferred breeding grounds of the mosquitoes. Good malaria protection is therefore necessary. 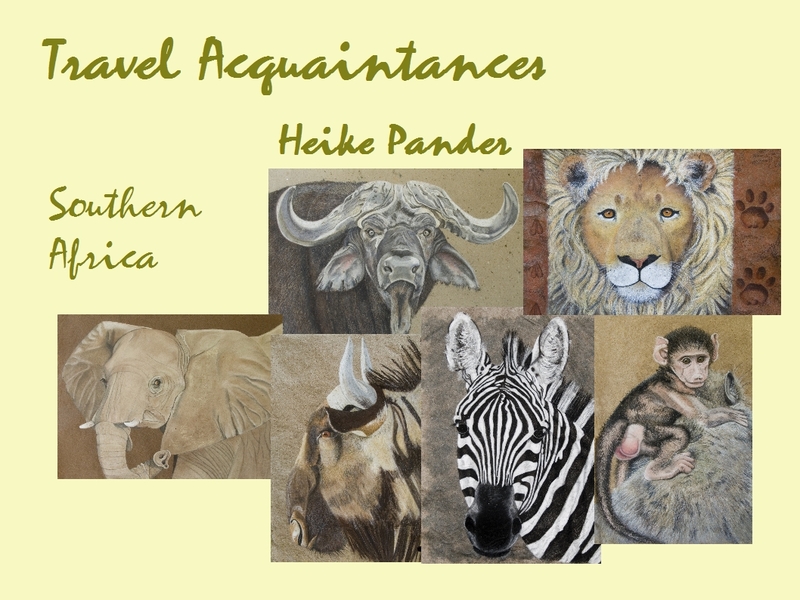 From our pleasantly cool hideout, we step out into the hot, dry savannah air. In zigzag we continue our walk through the man-sized grass. The sun has started to sink deeper on the horizon and immerses the environment into the most beautiful photographers light. Again and again we circle around dense scrubs. 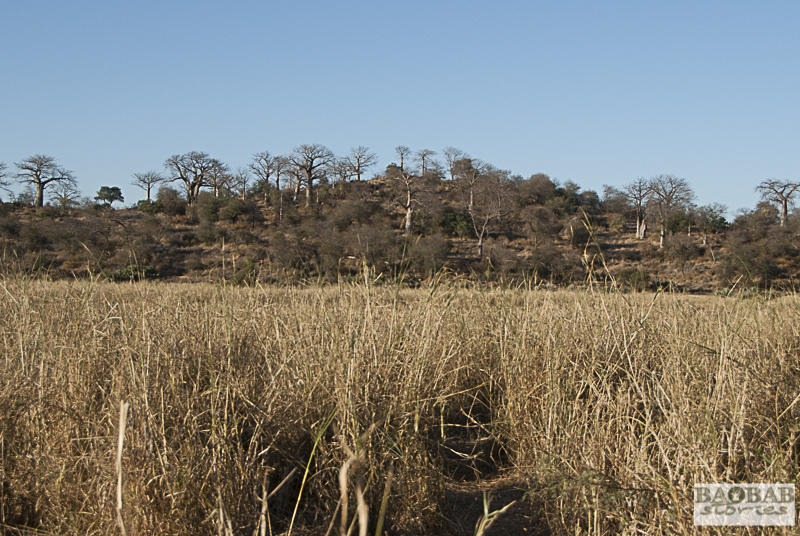 A range of hills in front of us hosts numerous baobabs. Currently, the giants do not carry leaves and stretch their gnarled, bizarre-looking branches far into the sky. 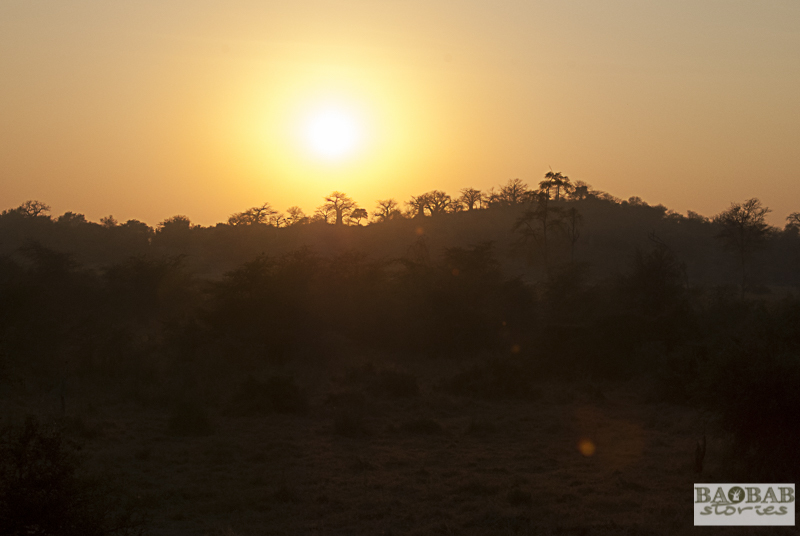 Time is too short to take it all in – we want to reach another goal behind the baobab hill: a natural dam which carries enough water even during the dry season and hosts a family of hippos. It is not easy to get there: Crater-like holes plaster the ground, their edges seem hard as concrete. Elephants left their foot prints during the last rainy season – the sun has meanwhile cemented them which makes it difficult for us to move forward. My left foot slips off and lands in one of the craters. Great. I am stuck. The colleagues come to my rescue, pulling and tugging at my arms. Finally – with an unpleasant squelching sound – the mud releases my soggy, dirty shoe. Lucky me – it is still on my foot. I try to see the positives of the situation and I am glad about the unexpected cooling effect the mud has on my sticky hot feet. 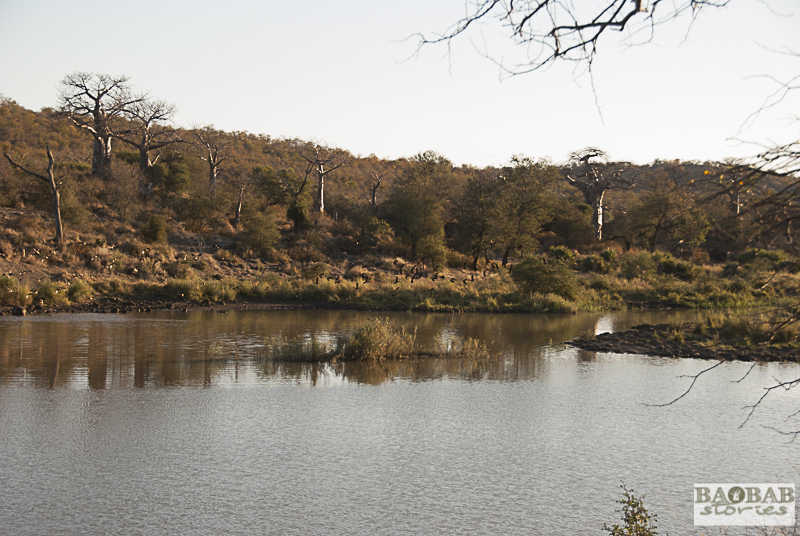 There is a lot going on at the waterhole around this time – we get a good view of the Makuleke birdlife which it is famous for. Even a small Malachite Kingfisher pays us a visit. It lands on one of the thin branches that protrude far from the shore into the dam. It glimpses at us suspiciously and decides to reinstall itself into hunting position a short distance from us. All of a sudden it shoots like a colorful arrow from its observation post into the brown water only to return there with a tiny, wriggling fish in its beak. Dinner seems ready. 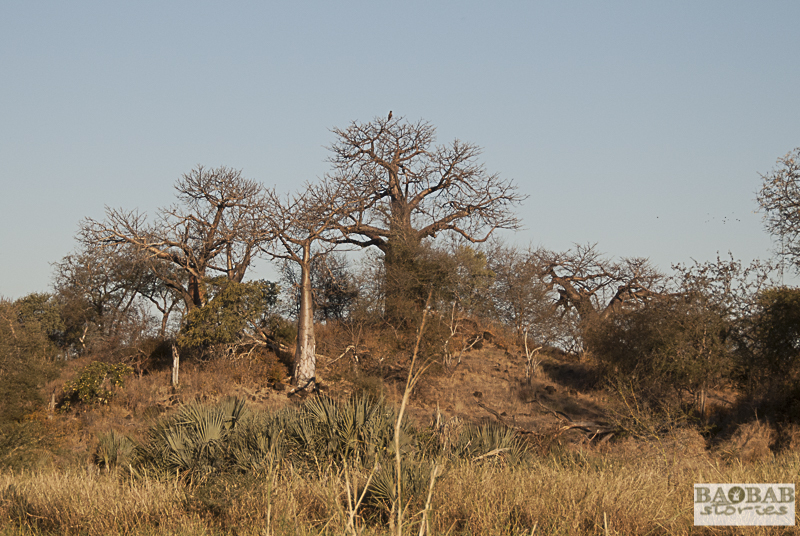 Many younger baobabs seem to grow in the vicinity of the dam. Maybe it has to do with the fact that elephants come here to drink regularly. 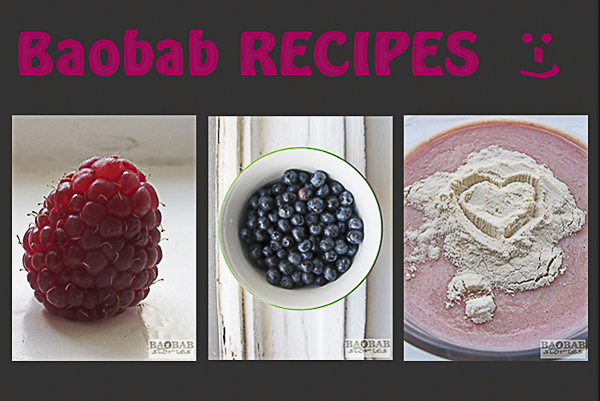 They like the fruit of the baobab and leave their droppings near the water source. 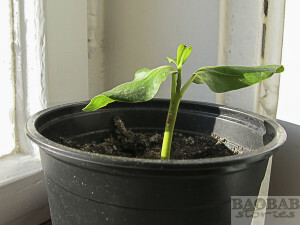 The little baobab seeds use the passage through elephantine bowels to germinate. In this glowing red light of the late afternoon the trees appear particularly magical. It is as if their bark doubles the intensity of the colors of the sky. 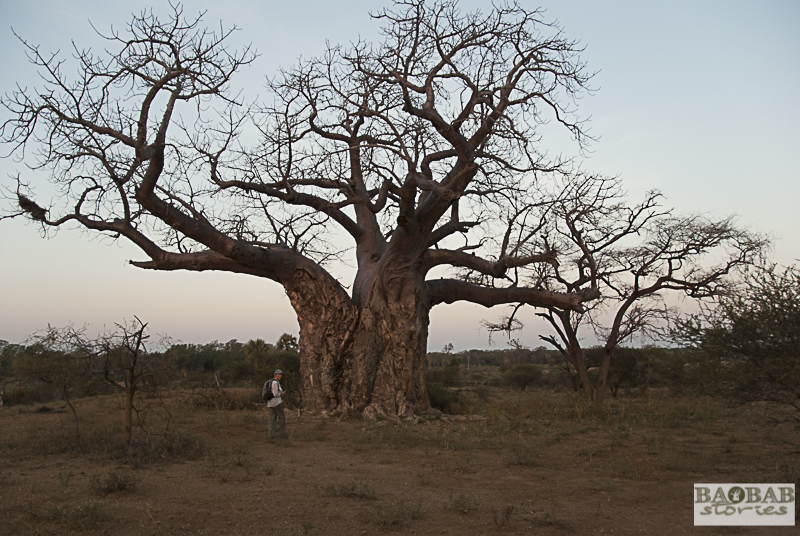 It is true – the baobab skin is shiny and therefore reflects the colors of the sky differently depending on the time of day. Time to head back to our camp. 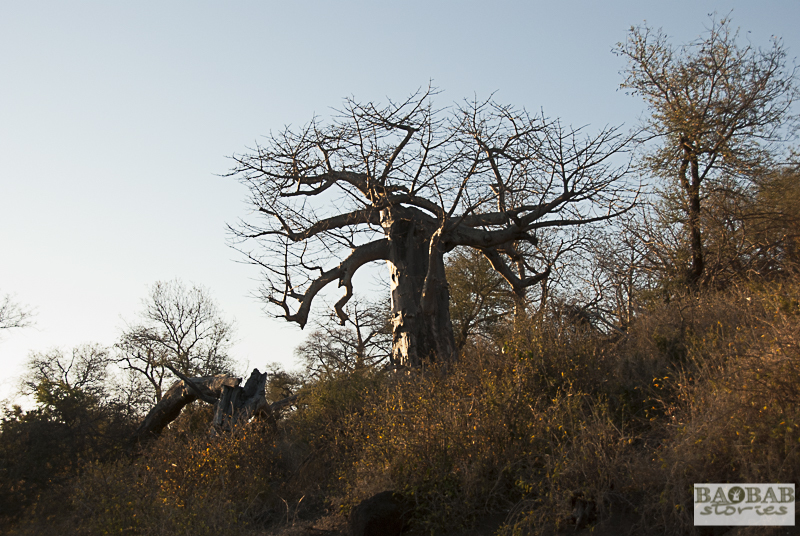 Next to our path we spot two beautiful baobabs. A third one seems to have died some time ago. 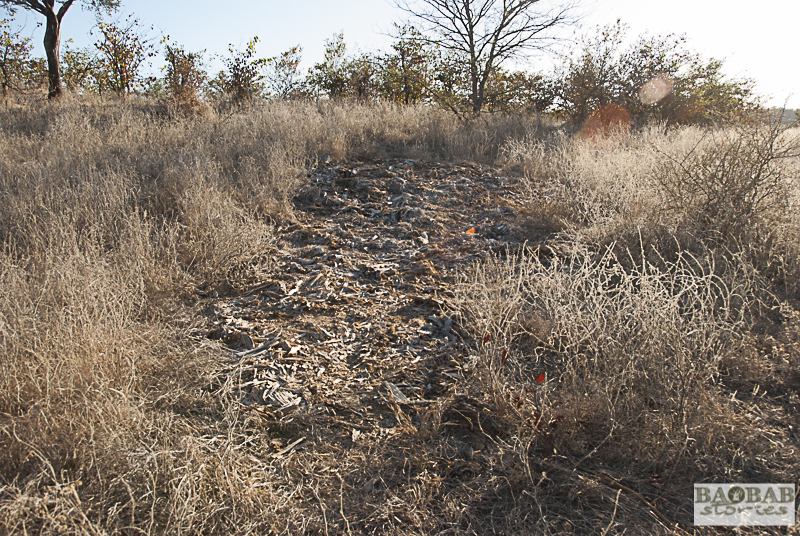 A pile of fibers on an oval imprint on the ground proves that it existed. The oval allows a guess of the actual size of the former giant as long as it was alive. It is difficult to tell what caused the end of the tree – whether it died naturally of old age or of some disease. However, its decay is very fast: first, elephants take out branches and pieces from the trunk. They chew on it and extract nutrients and water from the material. Those left overs of the tree falling to the ground do not last long either. Termites and other insects quickly decompose what is left. After about one or two years, the former giant will be completely recycled. Not far from the camp we reach another beautiful giant. The old baobab lives on a hill. The light is breathtaking. I could sit in front of it for hours and watch the change of light and colors on its trunk. One cannot “walk” them all in one day. 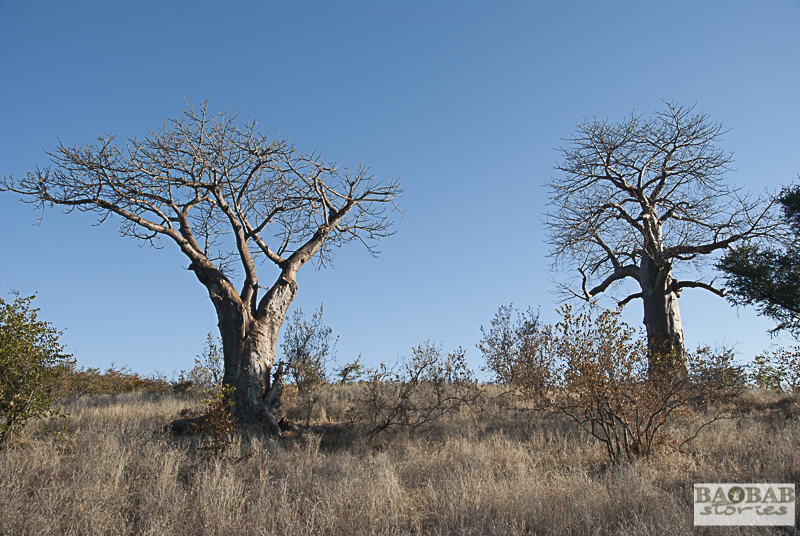 My baobab success story continues the following morning as we pass several of the trees standing close to each other. One of them seems a little skewed from the side and quite slim. However, its appearance seen from the front is unbelievable. I wonder how these trees, in spite of a certain imbalance in their structure, keep their balance and do not just tip over. Looking at the statics, this seems like a great achievement of many of the giants. They store enormous amounts of water in their trunk and branches – maybe the water pressure makes them stay upright? Why do they not drop the largest branches off? The tree in front of me houses a natural beehive at one of its sides – the humming seems a bit spooky, unless one can see the bees. The tree is hollow inside. Wooden pegs on the inside lead downwards. Those who lived here long ago were able to get in and out easier. The hole seems a bit small as an entrance to a living space. Maybe it has not been used for a long time and the hole is overgrown. 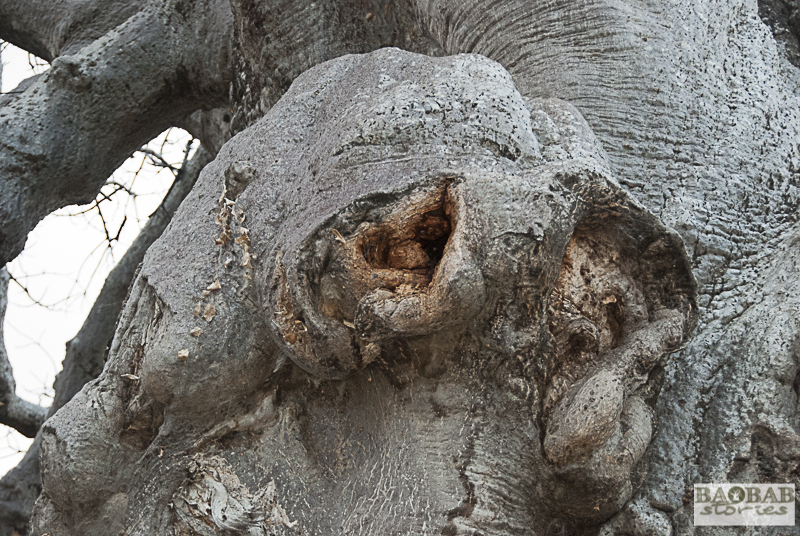 The trees can repair such injuries and grow back large areas of bark. That comes in useful after elephant attacks. 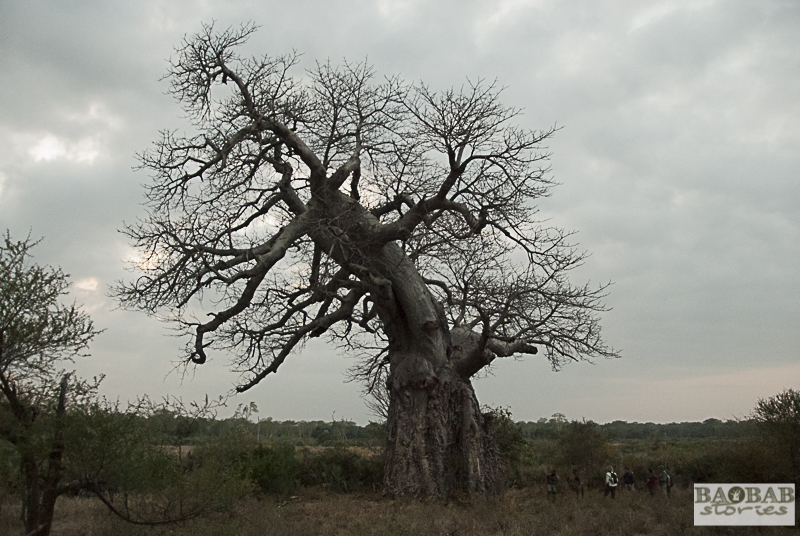 Even close to the Limpopo we found accumulations of strong and mighty baobabs. Scattered in vicinity of the trees lie human artifacts from times long gone. 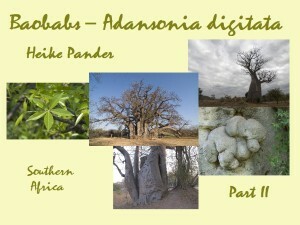 The early inhabitants of the area often sought proximity to baobabs. They used the trees in many ways. 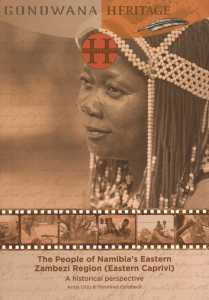 One of the large specimens nearby the Limpopo was inhabited by the Chief of Makuleke and his wife – I heard from one of our guides. 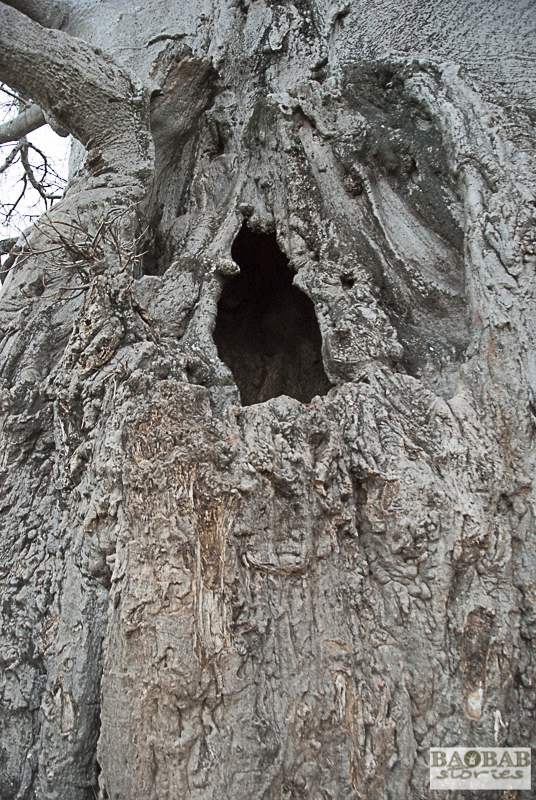 The cavity inside of the tree apparently provided enough space for them to live in. The tree grows on a small hill and offers a good view of the surroundings. The privilege of living in the baobab was reserved for the chief. His subordinates lived in huts some distance from the tree. In retrospect, it is often difficult to determine who was there first: the group of people or the baobabs. Because the trees were culturally and economically important for humans, they took their seeds and planted them in new settlements. 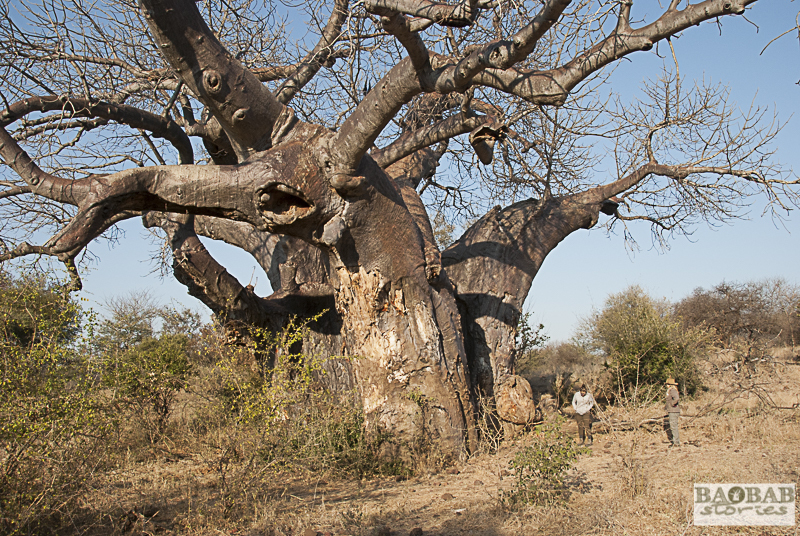 Every day was blessed with incredible sightings of baobabs in this magnificent wilderness. Some I saw up close – others just on the horizon. 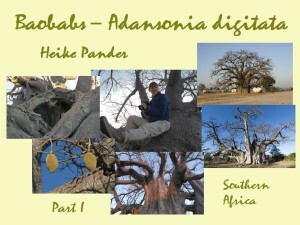 I had a fantastic time, filled with all sorts of stories of baobabs. 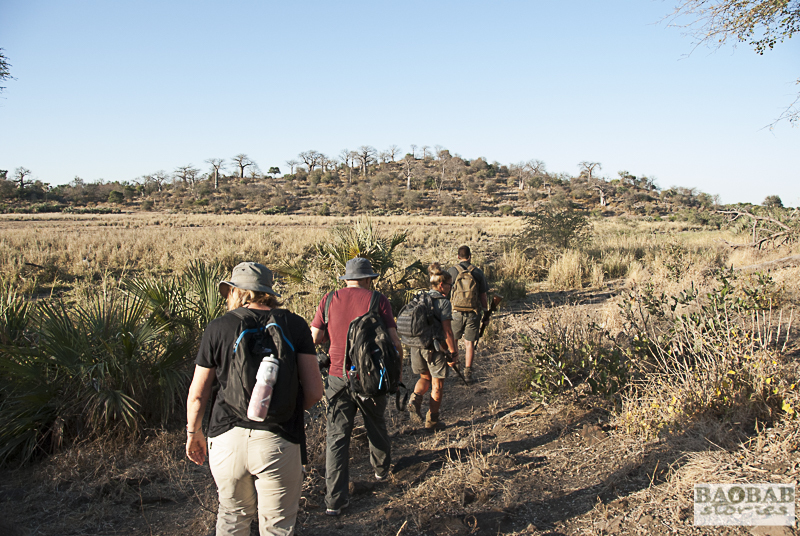 I could have stayed on much longer and studied the baobab locations even more intensely. 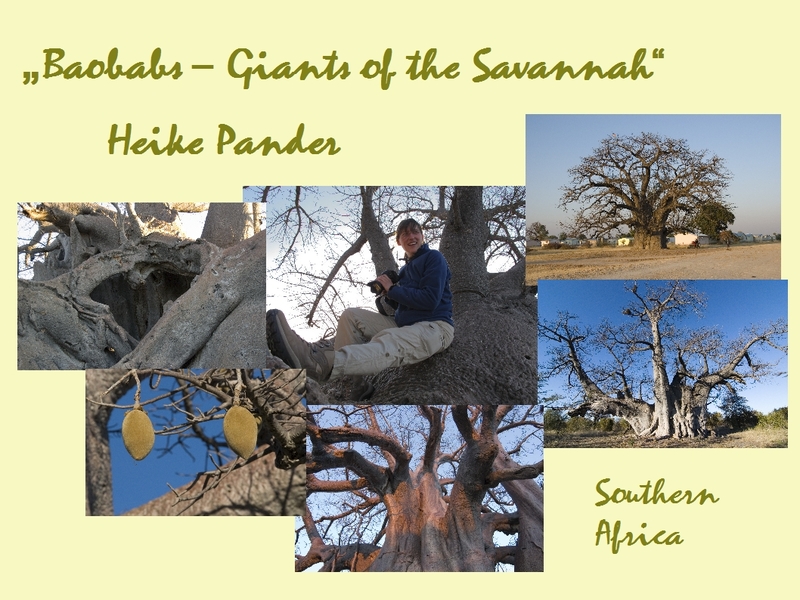 This entry was posted in Baobab_Location, Stories, Travel and tagged Baobab, Baobabs, EcoTraining, Kruger National Park, Makuleke Concession, South Africa by Heike Pander. Bookmark the permalink.